Put a dreamy spin on your sparkler with a ring in rose gold. "Rose gold ring sales quadrupled in 2015. With celebs like Blake Lively and Leighton Meester sporting rose gold, I see no end in sight," says jeweler James Allen. 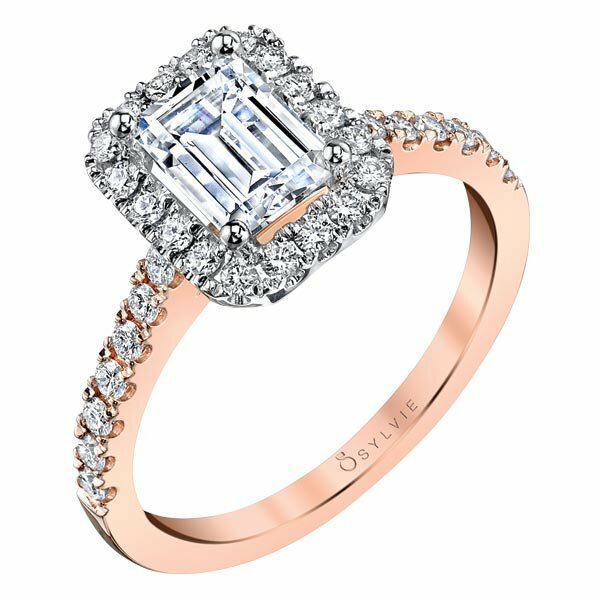 Rose gold halo ring with pavé diamond setting by Sylvie Collection. Center round diamond ring in rose gold by Tacori. 18k rose gold pavé diamond band by Danhov. Rose gold ring with interlocking pavé band by De Beers. Rose gold ring with twisted pavé by Angel Sanchez for Kay Jewelers. 18k rose gold pavé solitaire ring by Carizza.